Constance Kellough has an extensive background in teaching, facilitation, and speaking. Over the past 21 years as Founder and Publisher at Namaste Publishing, she has introduced a wide range of spiritual books to the world. She brings to her own approach to Innerbody Meditation a 20-year background with three spiritual teachers: Eckhart Tolle, Barry Long (deceased) and Joel Goldsmith (deceased). Of these three, her “root” teacher for Innerbody Meditation is Eckhart Tolle. She met Eckhart in 1997 and at her invitation to him he led her and 8-10 others in Innerbody Meditation for over a year. This “sacred sitting”, which she calls it, started well before Eckhart asked her to be his publisher. Constance agreed and the result is that The Power of Now, Stillness Speaks, and A New Earth came into being and spread widely across our planet. 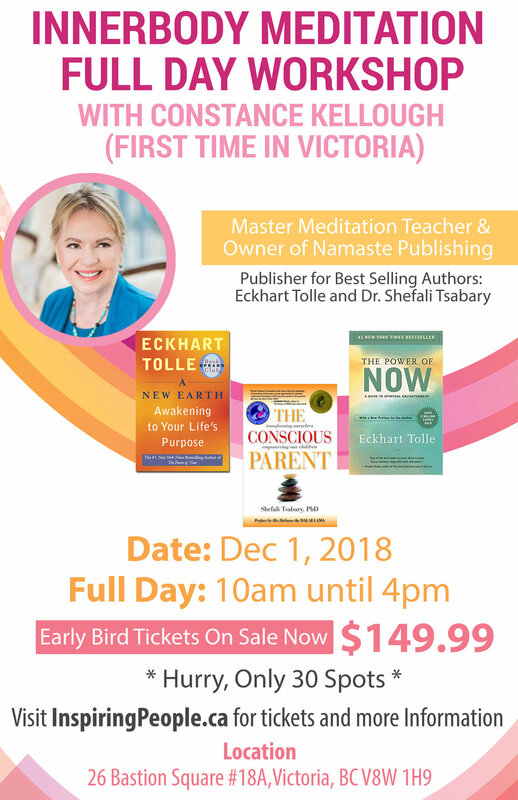 While she credits Eckhart Tolle with being her first and most powerful teacher in Innerbody Meditation, through Barry Long she learned how to fully explore the inner body, activate specific energy centers of consciousness within the body, and what certain experiences in doing so meant. Through experience she knows – and is now teaching – that it is only by entering the inner energy body that you can go beyond its confines to a state of still peace, to experience the Presence of God within you – as you! !